Home » Rare Finds » Watch Fourth of July Fireworks #DisneyParksLIVE Tonight! Now - I'm not saying that watching "Disney's Celebrate America! A Fourth of July Concert in the Sky" on your computer or mobile device is as good as being in Disney. There are however some definite advantages to home viewing! Such as no crowds, no sweltering heat, comfortable seating from your couch, and you don't have to fight the rush to get on the bus after they're done. 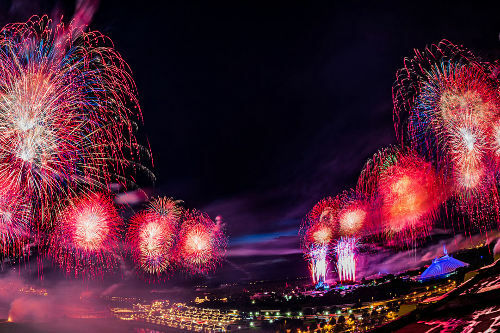 #DisneyParksLIVE Fourth of July live stream is one of the most popular of its annual shows. To tune in, bookmark this page at the Disney Parks Blog or simply visit the Disney Parks Blog at 9:10 p.m. ET on Fourth of July.